CAS (Clean And Simple) is a type of card I always struggle with. Every time I finish one, I think it just needs something else. ANYthing else. It's so BARE! When I finished this card, however, I was pleased. It said and did just exactly what it needed to do. Without a lot of fuss. What more could you want, eh? In my previous card, I was celebrating my Goddaughter Marissa's high school graduation. This time, it's a birthday. 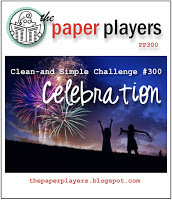 This is the 300th challenge the Paper Players have issued! I couldn't resist celebrating something so important! To create the nifty balloon, it took a bit of kissing. SMOOCH! I inked up a balloon from an old Paper Pumpkin kit with Pool Party ink. 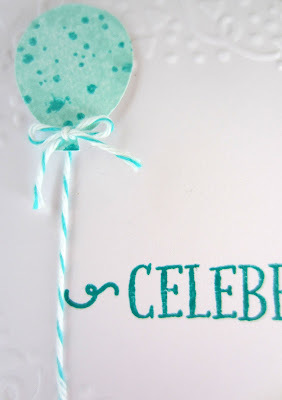 I then inked up the splatters stamp from the Awesomely Artistic set (page 144 of the new big catalog) in Bermuda Bay. 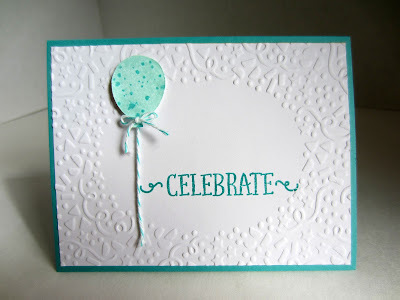 With my inked splotches stamp in one hand, I kissed it to the inked-up balloon stamp. This introduced a design on the balloon in another color. What a simply cool -- Awesomely Artistic! - technique to add a little interest with little to no work. 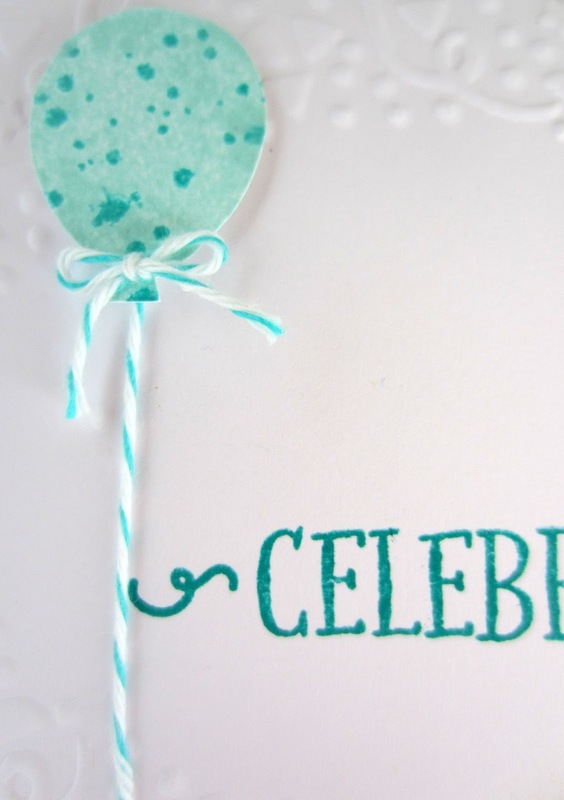 The "celebrate", inked in Bermuda Bay ink, is also from the same Paper Pumpkin kit. VERY USEFUL things, those stamp sets that come with each month's Paper Pumpkin kit. I use them A LOT! This is sweet, simple, and just beautiful! 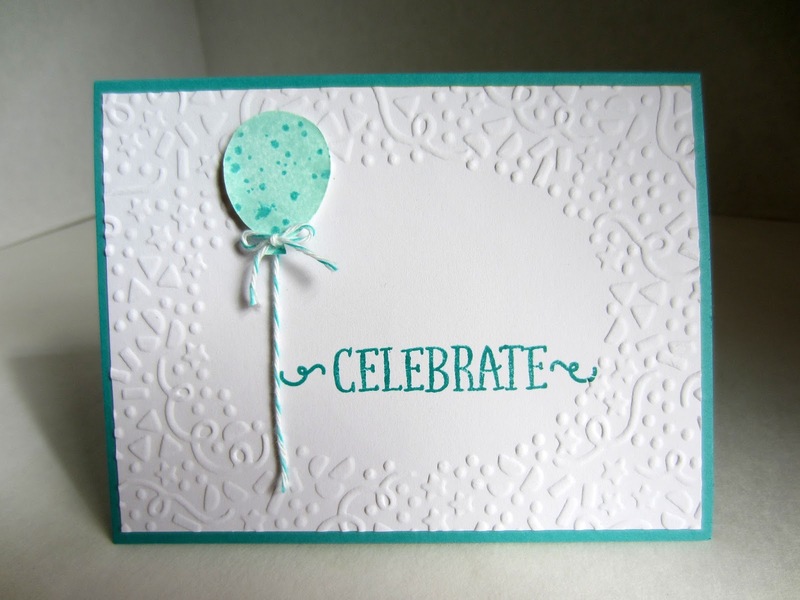 I found you through the No Rules Weekend Blog Party link-up. I love the colors and it is great you stopped by to share on the #OMHGFF this week! Awwww! I LOVE how cute this is! This would be great for lots of occasions. We love your card! Hope you can stop by again today:).